If I was going to list my family’s top 10 favorite dishes, I think I could confidently say this would make the top five. It’s the most common dish on the menus I found when I reviewed my family’s Italian Birthday Feasts, and that doesn’t even include our non-Italian birthday menus, which still often manage to feature this particular dish. This is not a quick & easy recipe, but the flavor makes it worth the extra effort. The last time we made it, we made a triple batch so we could have a few extra to put in the freezer for instant dinner parties. 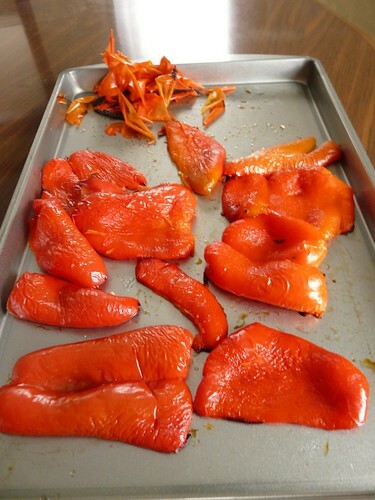 Since I clipped this recipe from a Better Homes & Garden’s feature on a family’s traditional recipes years ago, we’ve made this recipe so often that we always try to have a few extra bags of frozen roasted red peppers so we can make it easily at any time. I suppose we could also just buy roasted peppers if we were in a hurry, but we’re cheap, so we buy them up when they’re on sale at the peak of their season in the fall and freeze them so the lasagna will have the best possible flavor. Note: at this point you can bag up the peppers, removing as much air as possible, and put them in the freezer for later. 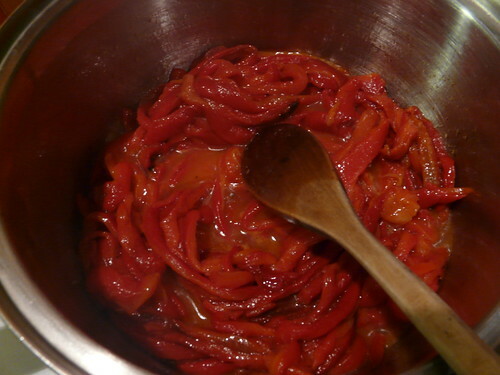 2 In a large saucepan cook red pepper in hot oil over medium heat for 1 minute. 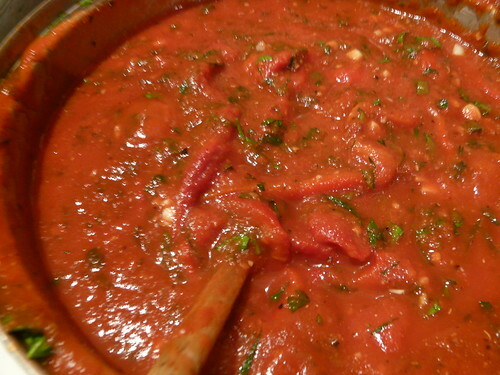 Stir in undrained tomatoes, parsley, garlic, and black pepper. Bring to boiling; reduce heat. Simmer, uncovered, for 20 minutes, stirring often. Set aside to cool. 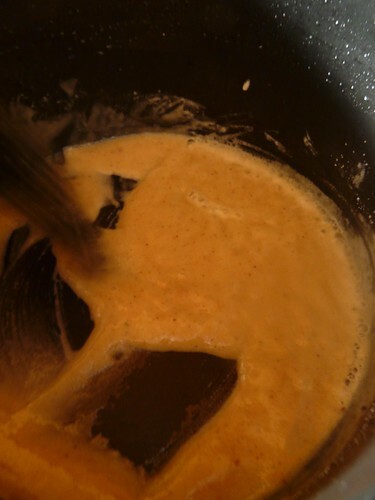 3 For bechamel sauce, in a medium saucepan melt butter or margarine. Stir in flour, salt, and nutmeg till smooth. 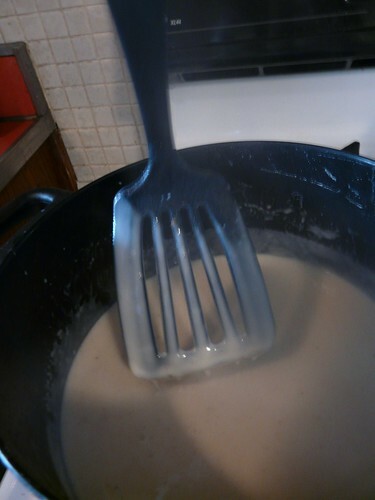 (This is called a “roux,” and is the first step for most white sauces, cream gravies, or cream soups). Add milk all at once. 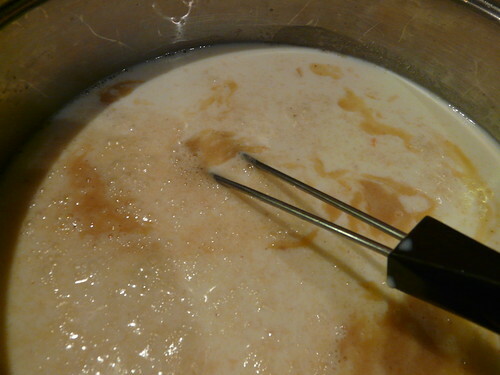 Cook and stir over medium heat till thickened and bubbly. Cook and stir for 1 minute more. Set aside to cool. 4 To cook pasta, bring a large pot of salted water to boiling. 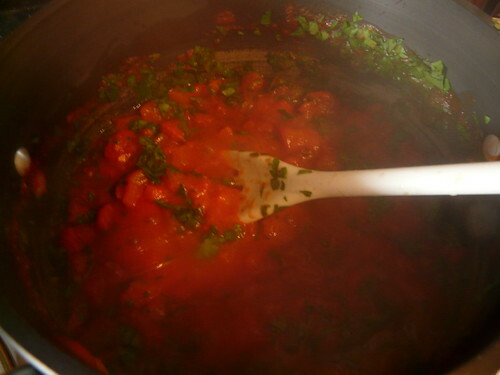 (Add 1 teaspoon cooking oil to water, if desired, to prevent pasta from sticking.) Add a few strips of pasta to water; return to boiling. Cook, uncovered, 6 minutes or till just tender. Remove pasta with a slotted spoon and immediately immerse in cold water. Repeat with the remaining pasta. 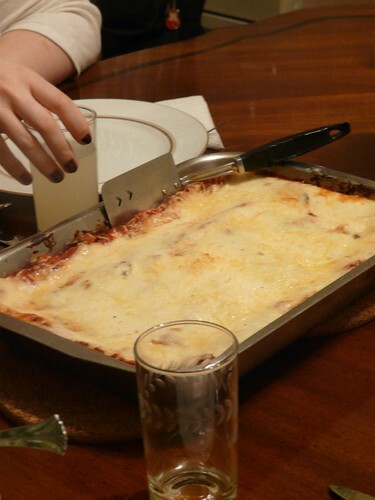 (Or, cook lasagna noodles according to package directions; immerse in cold water.) Remove cooked pasta with a slotted spoon and place on a large towel to remove excess water; blot dry with another towel. 5 To assemble, grease the bottom of a 3-quart rectangular baking dish. Cover bottom with about one-fourth of the pasta, trimming pasta as necessary. 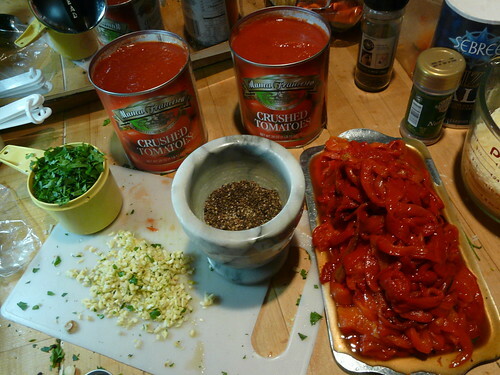 Spread about 1 1/4 cups of the red pepper sauce over the pasta. Drizzle about 3/4 cup of the bechamel sauce over the red pepper sauce; sprinkle with about 1/3 cup of the Parmesan cheese. 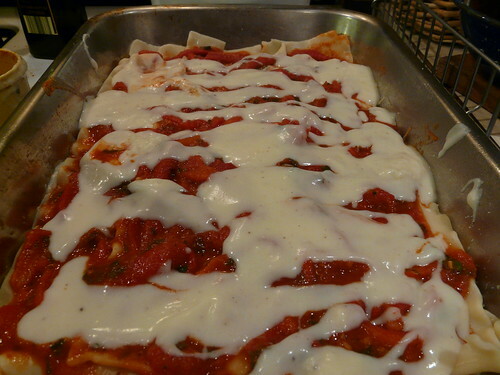 Repeat twice more with the pasta, red pepper sauce, bechamel sauce, and Parmesan cheese. 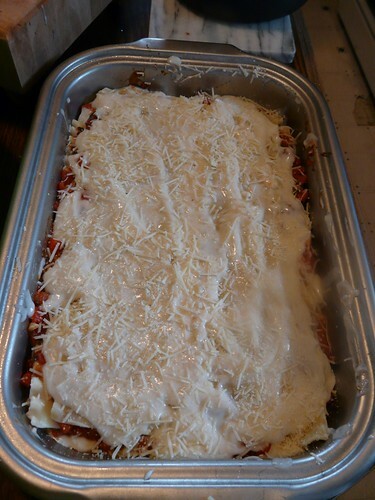 Top with the remaining pasta and bechamel sauce; sprinkle with the remaining Parmesan cheese. 6 Bake, uncovered, in a 350 F oven 30 to 35 minutes or till bubbly and light brown on top. Let stand 10 minutes before serving. Garnish with tomatoes and fresh herbs, if desired. Makes 8 main-dish servings. Make-ahead directions. 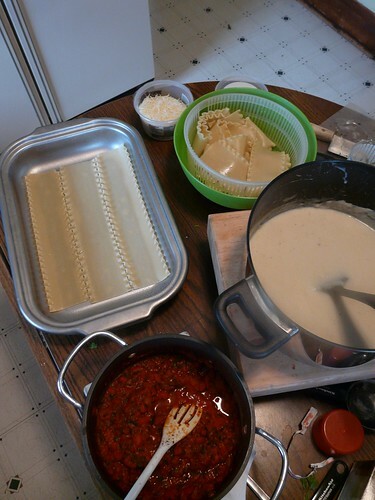 Assemble lasagna as directed. Cover with plastic wrap; refrigerate up to 24 hours. To serve, remove plastic wrap and cover with foil. Bake in a 350-F oven 30 minutes. Remove foil. Bake for 15 to 25 minutes more or till bubbly. whoa! I’ve never “liked” something on wordpress before. but there the option was… After all the appearances in the Italian feast section, I’m going to have to try this! We baked up one of the frozen ones yesterday and Mom was happy to have it on hand when she randomly invited 3 people home from church today for lunch. I was pretty happy to have her making it since I was puttering around the kitchen all day yesterday cooking and didn’t feel like making an earlier meal or eating leftovers right away. Also, the like option is from Jetpack if you ever want to find it and turn it on. I figure most people don’t bother with comments anymore, but fb has trained us to quick feedback. I like using it. Ugh, that’s circular. ok. just so you know. 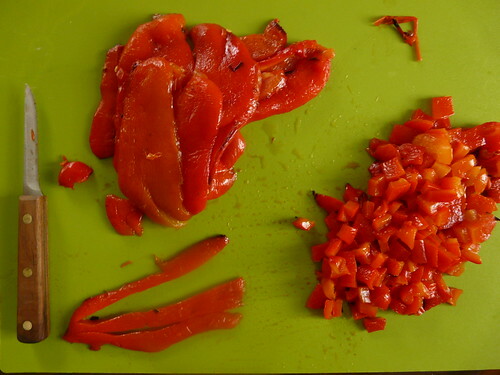 this is happening now because I found red peppers on sale for 50 cents (fitty sense). Don’t have all the ingredients on hand, but I will keep you posted. Awesome! I often do the roasting step in advance and stick them (peeled or unpeeled, depending on how lazy I feel – but definitely roasted & steamed ) in the freezer in a ziplock bag. 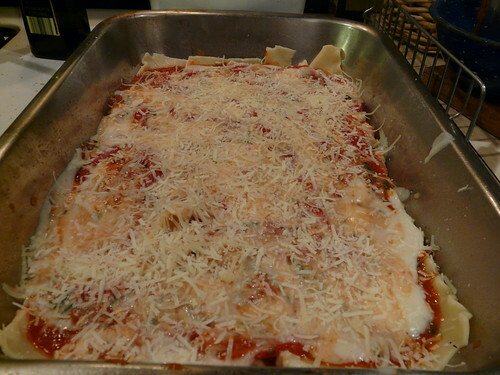 Then I can make the lasagna anytime I get the rest of the stuff together!